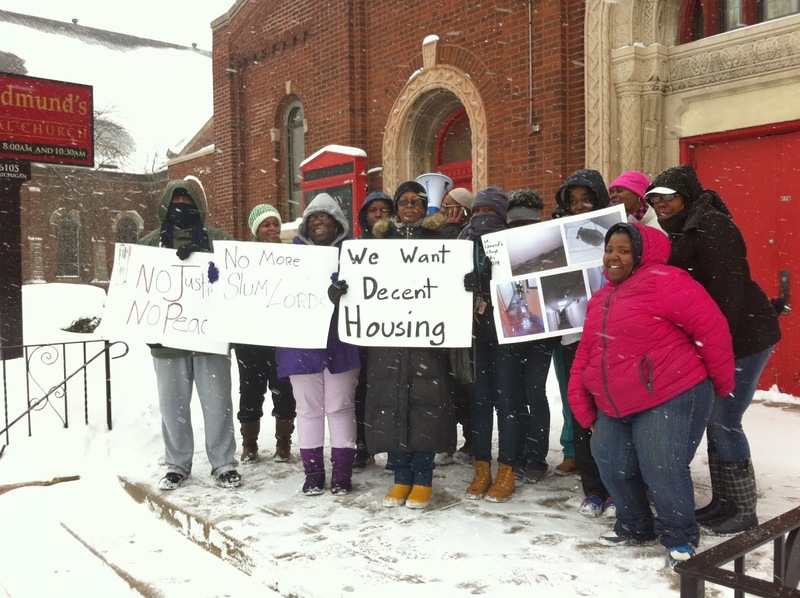 STOP | Southside Together Organizing for Power: St. Edmunds Tenants Takes Action! St. Edmunds Tenants Takes Action! This action will take Place at Chicago Low income Housing Trust Fund Board of Directors Meeting because Rev. Richard Tolliver is a board member and refuses to meet with his tenants to improve their living conditions by making the necessary repairs. Tenants are demanding to meet with Reverend Tolliver so that he can do something about their inhumane living conditions, which including: rodents, leaky windows, mold, disrepair & more. On February 5, 2014, the Tenants from St. Edmunds Village located at 6253 S. Michigan showed sheer determination as they marched down the street, in the snow, to 6105s Michigan to confront their Landlord Reverend Richard Tolliver at St. Edmonds Episcopal Church. After an almost 2 year struggle endured by the St. Edmunds Tenants with management and Housing and Urban Development (HUD) to improve their living conditions, the tenants have not been getting much of anything but the run around. Several attempts have been made to meet with Rev. Tolliver and every time he refused to meet with the tenants. Reverend Richard Tolliver and St. Edmunds Redevelopment Corporation (SERC) recently refinanced 6253 S. Michigan for $950,000.00 yet very little has changed. Although new dollars are coming in tenants still face: rodents, leaky windows, mold and more. Rev. Richard Tolliver is responsible for constructing and rehabbing at least 598 units of housing at a cost of $72 million dollars and is currently underway with a new project costing an additional $24 million dollars. He also sits on the board of the Chicago Low Income Housing Trust Fund. As a leader in low income housing he has a responsibility to ensure his tenants live in decent conditions. The St. Edmunds Tenants Council will be joined by Southside Together Organizing for Power, Fearless Leading by the Youth, and NAHT.